In all, nine Patels died in the agitation, which turned violent on August 25, 2015 in Ahmedabad and other parts of the state. In less than a fortnight’s time, the state declared Rs 4 lakh ex-gratia to the kin of those who had died. Forming 12 per cent of Gujarat’s population, Patels have for long formed a major voterbank for the BJP. In charge of social justice and empowerment department, the senior minister’s response came during a meeting with a team of Dalit rights activists went to meet Vora on Monday in Gandhinagar. “We asked him why couldn’t the state government adopt the same criterion be applied in the payment of ex-gratia to Dalits”, Kirit Rathod, who led the team, told Counterview. Three youths – Pankaj Sumra, Mehul Rathod and Prakash Parmar – died in police firing on Dalit protest rallies, which took place on September 22-23 in Thangadh, an industry town in Surendranagar district, about 170 kilometres west of Ahmedadbad. Dalits form 6.7 per cent of Gujarat’s population, and not considered important enough in BJP votebank politics. The Dalit activists had gone to the minister with a list of demands on the Thangadh incident, drawing his attention to the plea by a former Cabinet minister, late Fakirbhai Vaghela, for CBI inquiry into the Thangadh incident. “Even the chargesheet in two of the three deaths has not been filed”, a letter, addressed to the Gujarat chief minister, a copy of which was handed over to Vora containing the demands, said. The claims said, in a right to information (RTI) reply, the Gujarat government has said the file notings which contain Vaghela’s request for CBI inquiry has been “lost” and “cannot be found” in the state home department. “This suggests utter indifference on the part of the government towards the incident even four years later”, Rathod insisted. 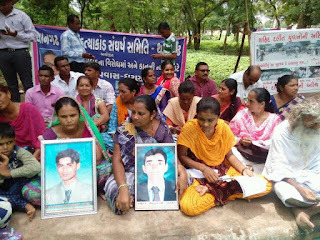 Meanwhile, family members of the three Dalit youths have begun a sit-in Gandhinagar, Gujarat capital, to protest against the failure of the Gujarat government to investigate the firing incident amidst facts having come to light, which suggest the police is all set to close the police firing case by characterizing it as “C summary”. Other demands put forward by the Dalit Adhikar Manch, whose activists met the minister, include transferring the police firing case from Surendranagar to Ahmedabad sessions court, immediate appointment of a special government pleader to expedite the case, arrest of the culprits responsible for the police firing, and release of the inquiry report on the Thangadh firing authored by Sanjay Prasad, IAS official.